At the Total Rewards & Wellness Conclave’19, Smarajit Banerjee, Head HR, Hero MotoCorp, discussed the company’s strategy to engage blue-collar employees and drive productivity. Being the world’s largest two-wheeler manufacturer for 18 years in a row is no mean feat, and yet Hero MotoCorp has achieved it. With over 7.6 million bikes sold in the last year, Hero manufactures a vehicle every 18 seconds. It is clear that sustaining a highly motivated workforce in the auto sector is indispensable because the productivity cost of each second is higher than in other industries. Let us take a closer look at how Hero has been engaging its blue-collar employees to ensure high levels of motivation and productivity. In the auto sector, the talent pool is limited and information on wages, benefits, culture, and job opportunities easily flows from the employees of one organization to another. In this context, the challenge of sustaining high levels of employee engagement becomes even more complex. Furthermore, since policies regarding wages and benefits are not confidential, there is a constant pressure to offer the ‘best-in-industry’ salary and advantages. This pressure to offer the highest wages in the industry is, naturally, felt the most by industry leaders like Hero. But, more than numbers and analytics, the mathematics of wage elevation depends on the ability and the willingness to pay and the challenge is to maintain a sane balance between the two. Most technical job roles in the industry revolve around production or the assembly line and it becomes critical to incentivizing superior performance and productivity. However, production plants operate differently, and rewarding employees working in different locations according to the same parameters isn’t effective. The rewards strategy and incentives structure at Hero thus varies from plant-to-plant. This allows a greater degree of flexibility in policy-making and helps in accounting for otherwise complex components, like plant-age, location, and production processes. Since the incentives are tied to the overall performance of the entire plant, there is a natural need for employees to collaborate and work together to deliver the best results. What’s more, to ensure a sense of equality and fairness, several of the company’s benefits (like medical) are uniformly offered to all employees. Apart from offering competitive wages and engaging workplace culture, it is critical to ensure that the employees feel valued. The diverse workforce at Hero, which comprises of individuals hailing from all parts of the country, often has to relocate from their hometowns to plant locations. Thus, it is important to walk the extra mile and ensure that the employees, and their families, receive the support they need. In this context, Hero provides uniform housing and education facilities to their employees. Additionally, there are several ways in which employees directly influence the policies that impact them. Feedback is regularly elicited from employees through multiple channels and used to continually improve the company policies and culture. Unlike several other sectors, blue-collar employees serve as the backbone for the auto industry but most technicians working in a production plant do not undergo expert academic or skill training. However, this doesn’t serve as an obstacle for growth in Hero. In addition to having robust policies that help people grow in their personal and professional lives, there are no barriers to progression. Employees who joined the organization in the role of a technician have gone onto head business-critical departments as well. This has been facilitated by comprehensive functional, behavioural, and leadership training programs which help employees hone their skills and talent. Several improvement circles and activity groups exist in the company that encourages employees to learn, grow, and take initiative. At the end of the day, the challenges of sustaining excellence while ensuring business growth have been and will continue to be, omnipresent. What has helped Hero MotoCorp dispel rumors and dodge anxious speculations in an unforgiving industry is a clear focus on making their customers and employees happy and keeping them engaged. 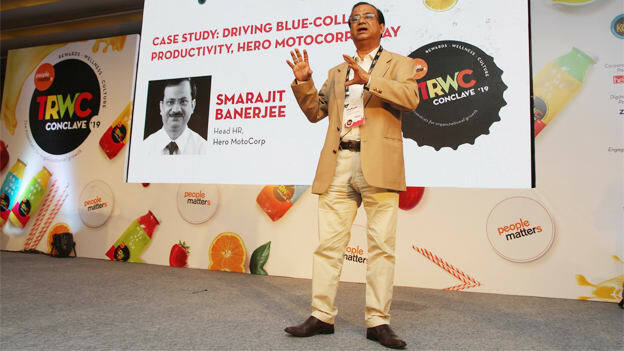 (This article is based on the session ‘Case Study: Driving Blue-Collar Productivity, Hero MotoCorp’s Way’ by Smarajit Banerjee, Head HR, Hero MotoCorp, at the Total Rewards & Wellness Conclave’19 on 16th February 2019).